Alone in the middle of the Pacific Ocean, far away from any other land mass, and completely surrounded by amazingly clear water, the Hawaiian Islands couldn’t be more ideal for shoreline fishing. 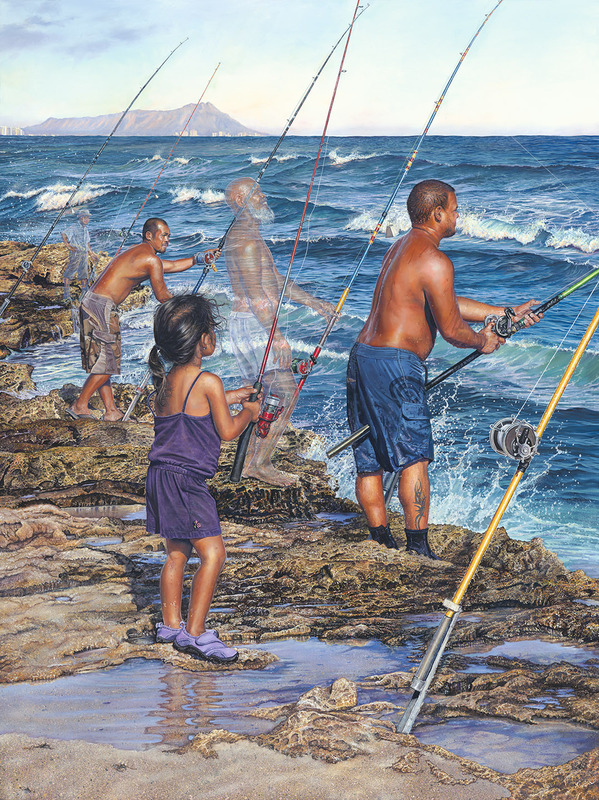 Hawaii is a state that doesn’t require a fishing license for ocean fishing and most kids raised in Hawaii start our oama fishing with bamboo poles (usually equipped with hook, lines, and sinker) – something that is never really outgrown. Along the coastlines in summer and early fall, people can be seen standing knee to thigh-deep in the water, catching oama, often to use as bait in the larger game sighing. Probably not far from these fishermen, larger groups of anglers with longer hand poles or small spinning reel & rod outfits gather to fish for halalu or the larger akule (mackerel). The abundance of reef fish accessible by simple hand poles makes it impossible to predict what will bite. However, the oama, halalu, and akule are the ones chosen season after season. While ulua can be caught anytime of the day, it is particularly productive to fish for ulua overnight during the right moon phase. I has just finished painting my son-in-law Kekoa and the paint not yet dry on my canvas, when we got the exciting new that Kekoa had caught his first ulua – at noon full moon phase. But there is another lineup we must remember. We need to look at the lineup that cannot be seen with ordinary eyes – ad that line comes to us from another dimension. Stretching as far as one can “see” and beyond is the line of Hawaiian men from centuries past – a line that goes far beyond simply tracing the shoreline of Hawaii nei today This line reaches back in time, revealing the ebb and flow of countless men who all too briefly stood in this exact same place, tirelessly casting their lines into the sea for harvest or for the thrill of the ultimate catch; and, if we listen to the “music of the sea,” the rise and fall of the rolling surf high above the wind, becomes the murmur of the long-stilled voices of the line of men who have also stood right here on these same rocks, under the same afternoon sun… drawn by the lure of the same waters….